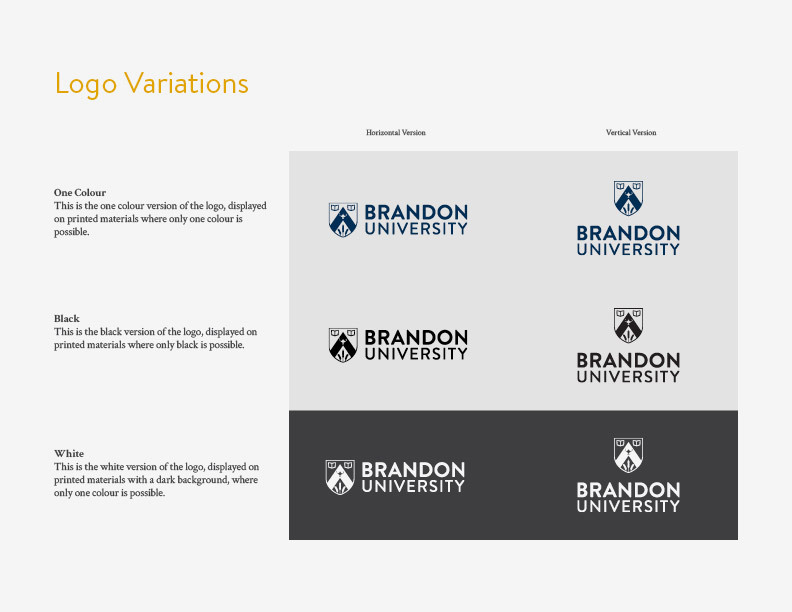 We worked w/ Brandon University to design a visual identity system that would reflect the character of the university. The following is a comprehensive breakdown of our project. This case study will take ~7 mins to read. 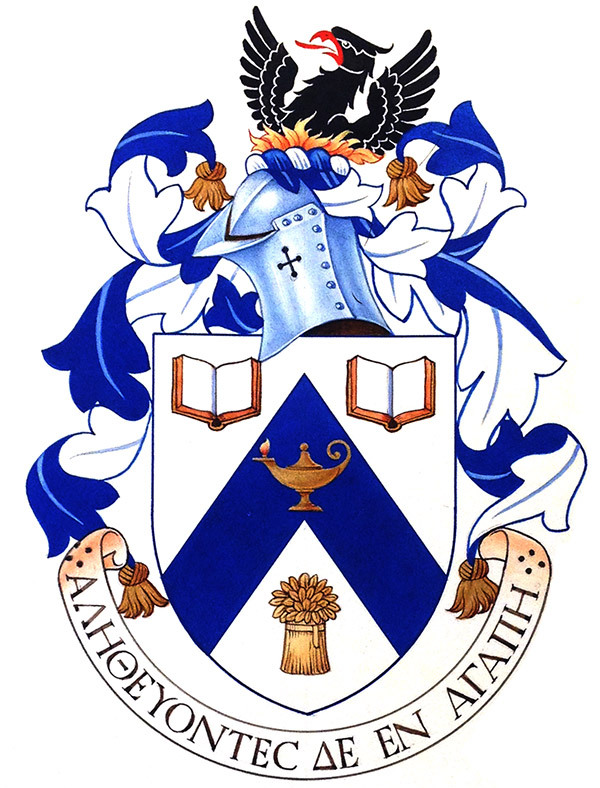 Founded in 1889, Brandon University (BU) is a pillar in western-Canadian education. With a focus on Education and Arts programs, it boasts the best student to faculty ratio in the country (12:7) and their Music department is rated one of the best in Canada. It is located in 'The Wheat City' – Brandon, Manitoba. Where are we going & where are we now? Brandon University's purpose is to create knowledge by educating its community. We began by aligning our project's success w/ the University's purpose. We asked ourselves how a visual identity would help BU educate its community. In order to educate its community BU needs to continually attract three main groups of people – students, educators, and faculty. Before they join the university, these people need to perceive it in a very specific way. Our goal was to create a well-designed and intentional visual identity to support the University's desired perceptions. 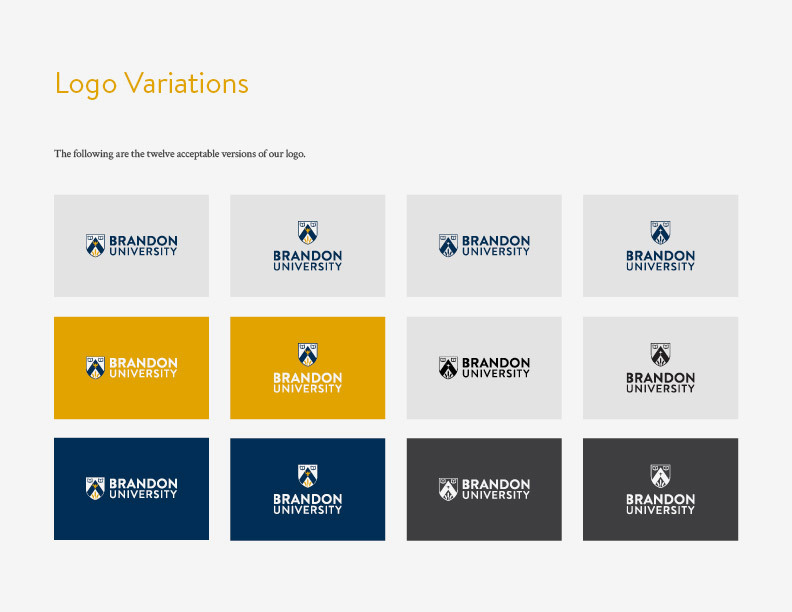 We wanted to develop a refined, cohesive, and unified visual identity to show Brandon University cares about itself – giving others permission to do the same. This is not unlike someone getting a new haircut and outfit; although the changes may appear superficial, they signal an effort for internal improvement. 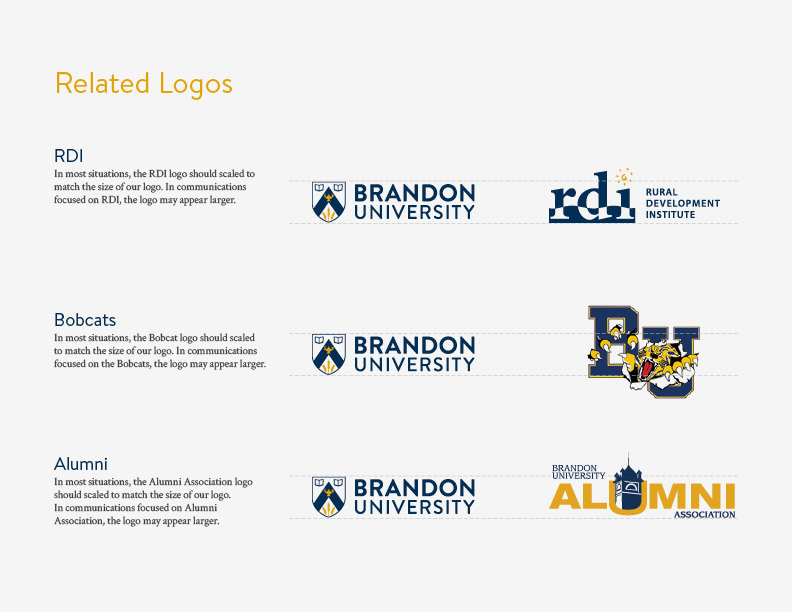 We aimed to improve Brandon University's brand recognition by using a consistent and particular set of visuals. This allows BU's communication materials to act as visual triggers and people to quickly associate them with the university. 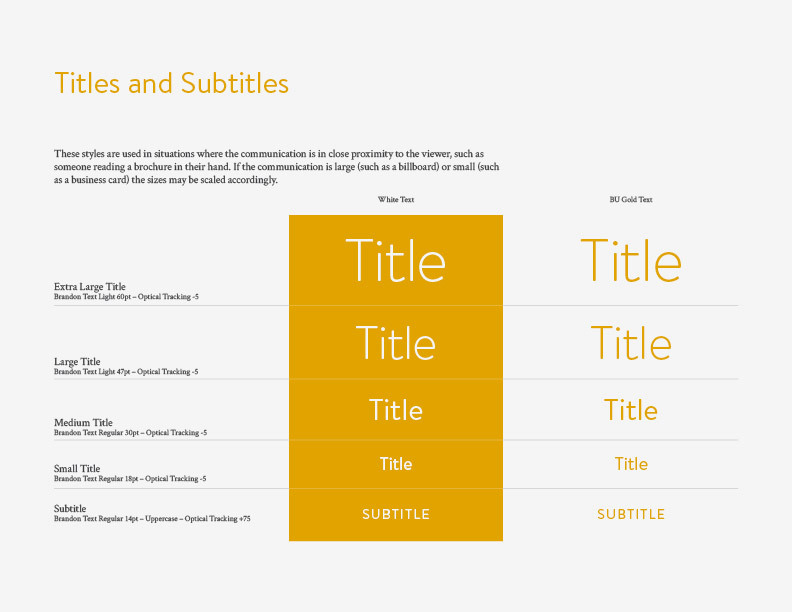 It requires a comprehensive package of templates for all BU staff and faculty. Next, we explored the university's current perceptions before crafting their desired perceptions. We interviewed over 150 people with the goal of understanding how BU was currently perceived. This included past, present, and future students and faculty, as well as the general Manitoban public. We surveyed over 400 current students and faculty to help understand BU's current perception. We asked respondents for their unfiltered thoughts on the university's value and appeal. We consulted and engaged key BU faculty such as directors, presidents, and the acting dean in order to ensure all parties were aligned. 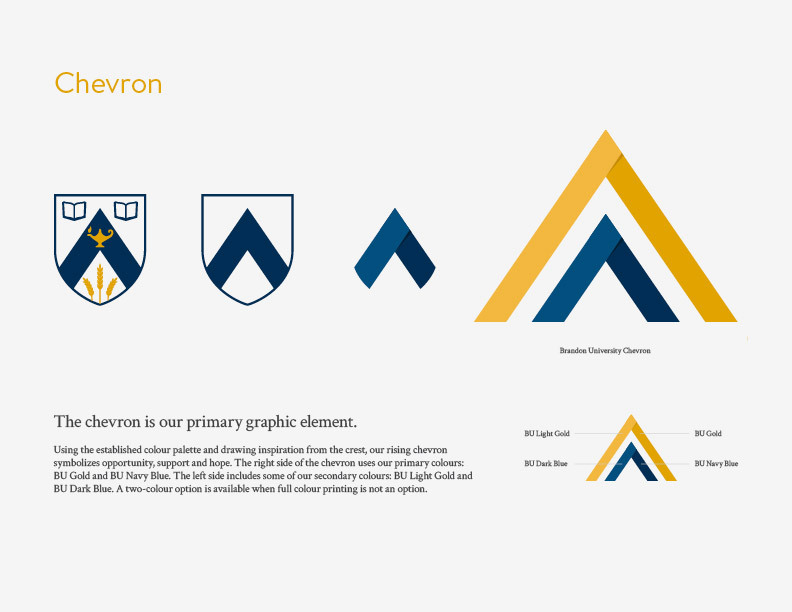 Our visual identity's objective was to strengthen the university's reputation as both a warm and welcoming community as well as a leader in innovation. Our research suggested prospective students and educators would be more likely to engage with BU when they perceived the University as welcoming, friendly, and approachable. We needed to avoid having them be perceived as elitist or insular. Our research also suggested prospective students and educators would be more likely to engage with BU when they perceived the University as innovative and progressive. This meant doing all we could to avoid being perceived as stagnant or uncreative. A visual audit and review of BU's peers was completed before designing its own visual identity system. What do welcoming and innovative look like? We designed a mood board to translate our desired perceptions into visuals. Once aligned with our BU team members, we developed the following components of the visual identity based on the mood board. Our strategy was to evolve the current logo (derived from the coat of arms) into something more appropriate for today's world. It was important to retain the brand equity built over decades while contextualizing the logo for the 21st century. In order to ensure the logo would be used properly, we formalized a set of standards around the use of the logo and articulated them in our standards guide. Using the established colour palette and drawing inspiration from the crest, the rising chevron symbolizes opportunity, support, and hope. The chevron is displayed on the bottom left of all communications where possible. Its unique shape and colour help create brand recognition. 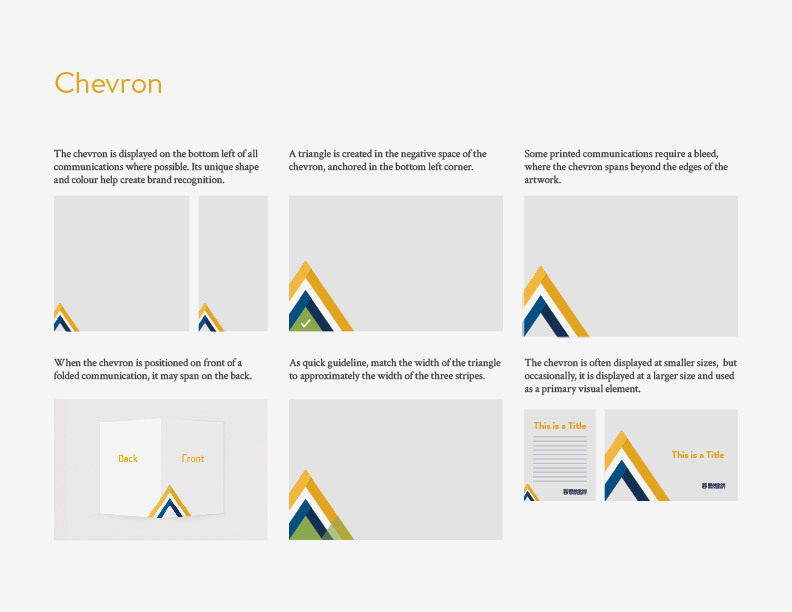 Our visual standards guide documented how to display the chevron on various communication and marketing materials. 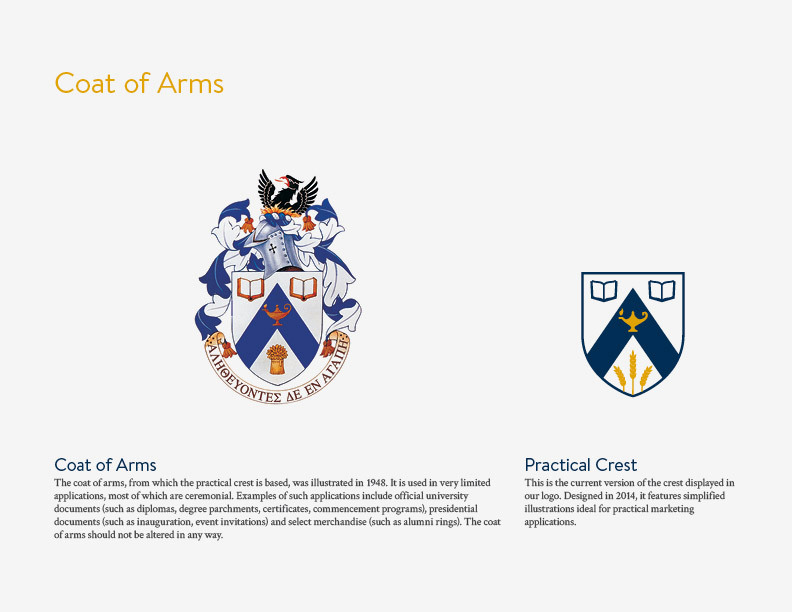 Gold and navy blue have been used as primary colours by the university since its inception. Our task was to define the exact colours to be used in communication and marketing materials – this had never been formalized or captured before. 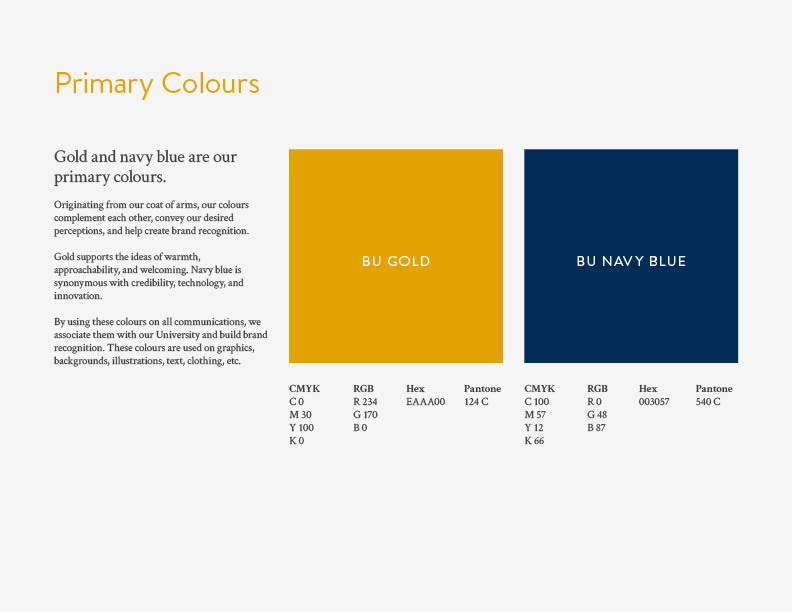 Originating from the coat of arms, BU's primary colours complement each other, convey their desired perceptions, and help create brand recognition. Gold supports the ideas of warmth, approachability, and welcoming. Navy blue is synonymous with credibility, technology, and innovation. 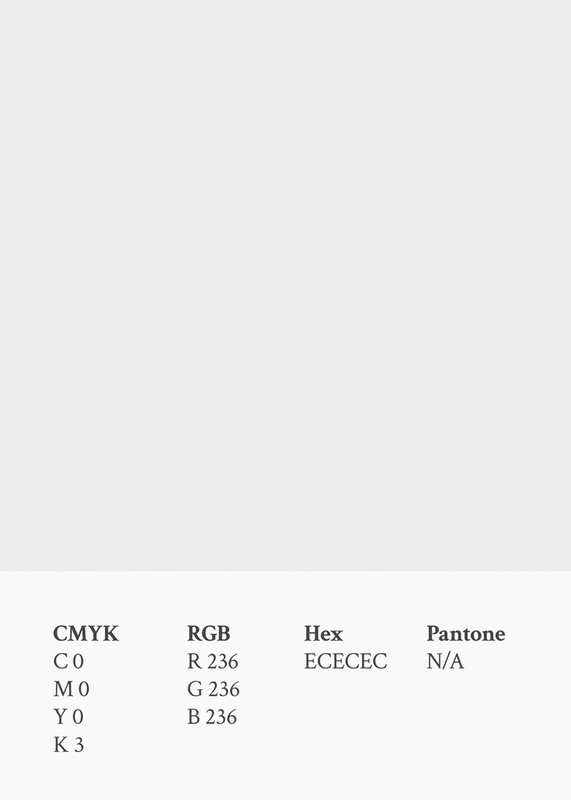 Our standards guide provided the exact values for the Pantone colour system, CMYK printing, RGB, and hexadecimal values. 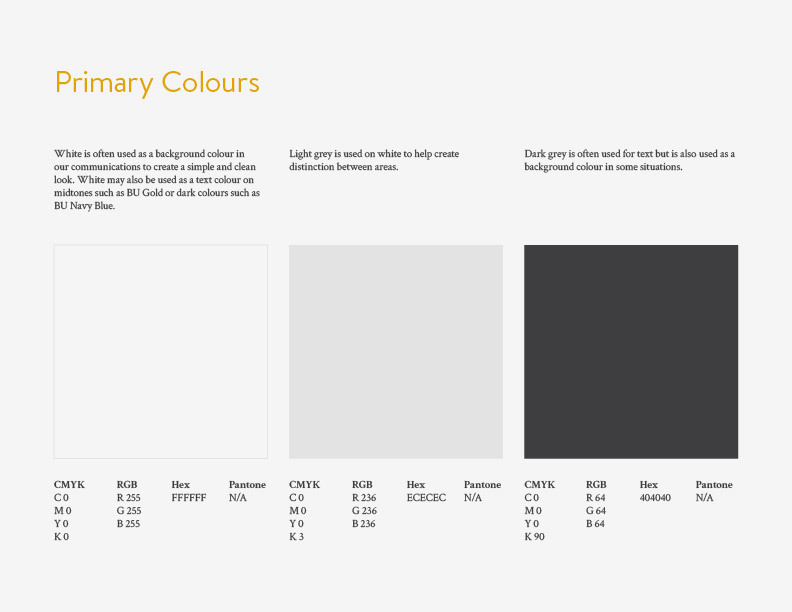 It also detailed which colours to avoid based on BU's peers. 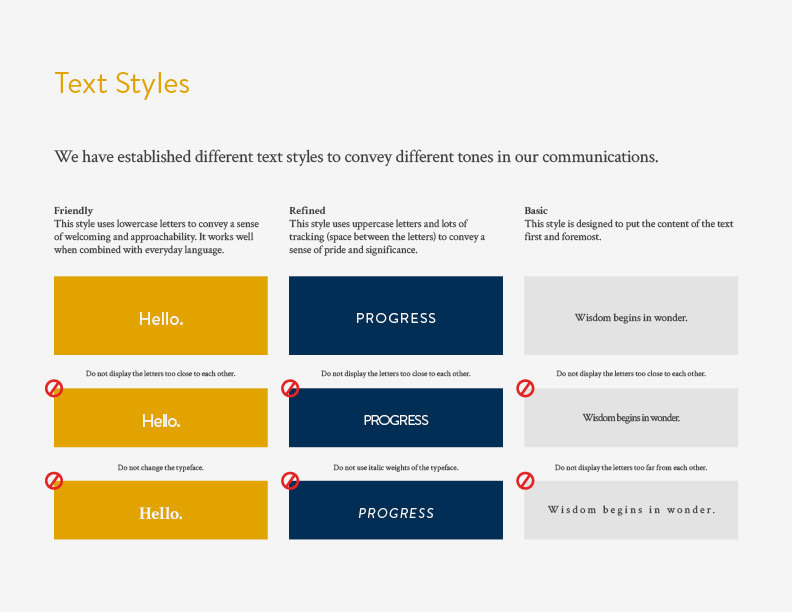 We selected primary and secondary type families and developed a series of text styles. Using geometric shapes and clean lines, Brandon Text is a modern sans-serif typeface ideal for headlines and messaging. It is a companion to Brandon Grotesque, the typeface in BU's logo. Rounded terminals and arms add a sense of welcoming and approachability. Crimson Text is a serif typeface designed for large volumes of text. Serifs are the extensions at the end of the characters, helping the human eye easily distinguish the letters and form shapes from the words. Our standards guide provided breakdowns of each typeface and it's family as well as alternatives for situations when the primary typefaces would not be available. 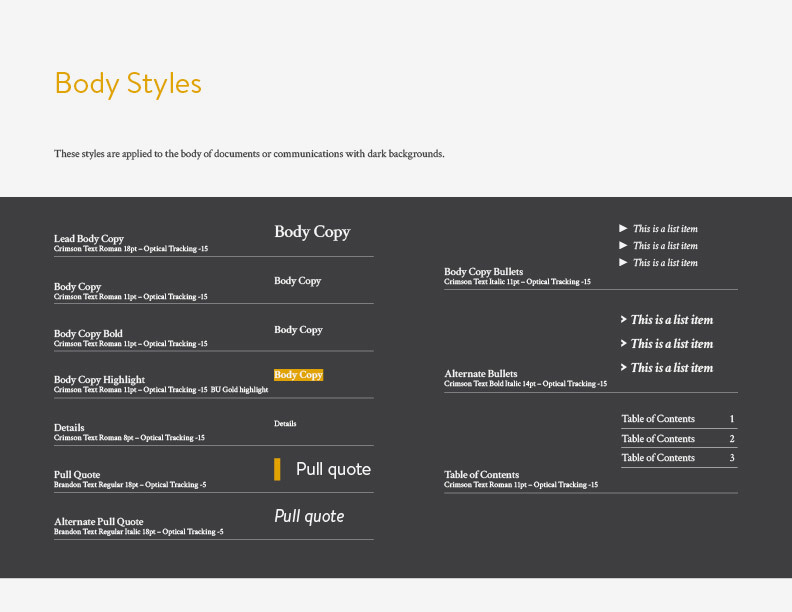 The guide also provided text styles and details such as proper and appropriate tracking, line height, text size, and colour choice. We fleshed out the visual identity with a set of complimentary graphics. The zigzag pattern is based on the geometry of the chevron. It is used as an accent rather than a primary graphic element. The shape of the triangles is based on the chevron. 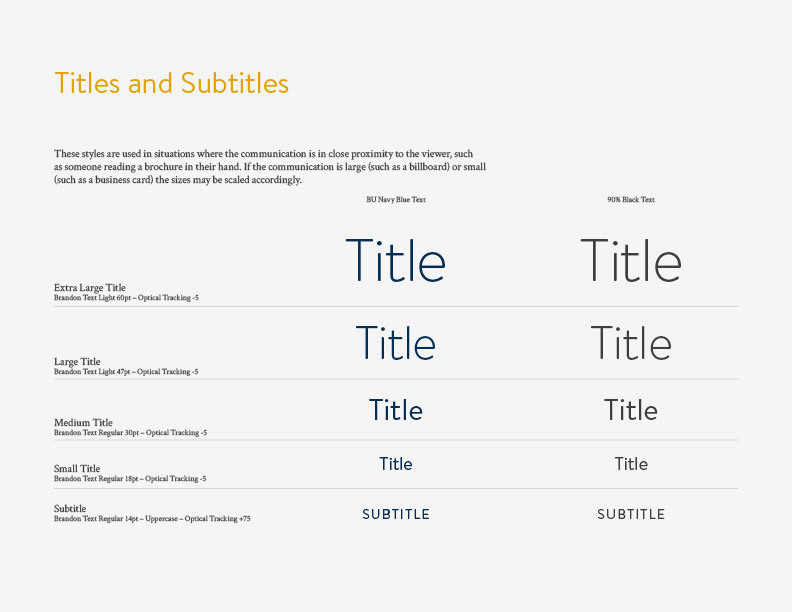 Triangles are used as bullets in certain text styles. We designed a reference guide for quick and easy access. By providing a digital and printed reference guide, we allowed communication staff to quickly find and use the essential technical information without having to open the comprehensive visual identity standards guide. Let's see identity in action. 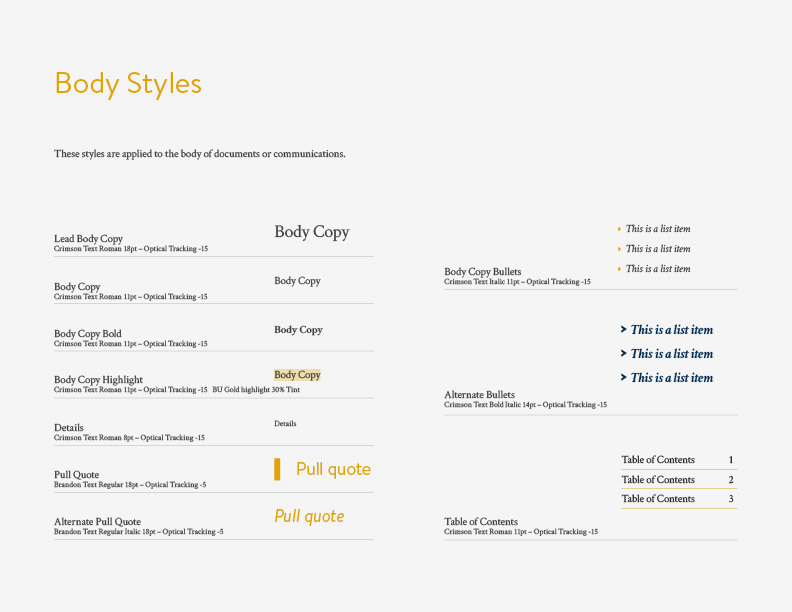 We designed all Brandon University communication templates as well as various applications. 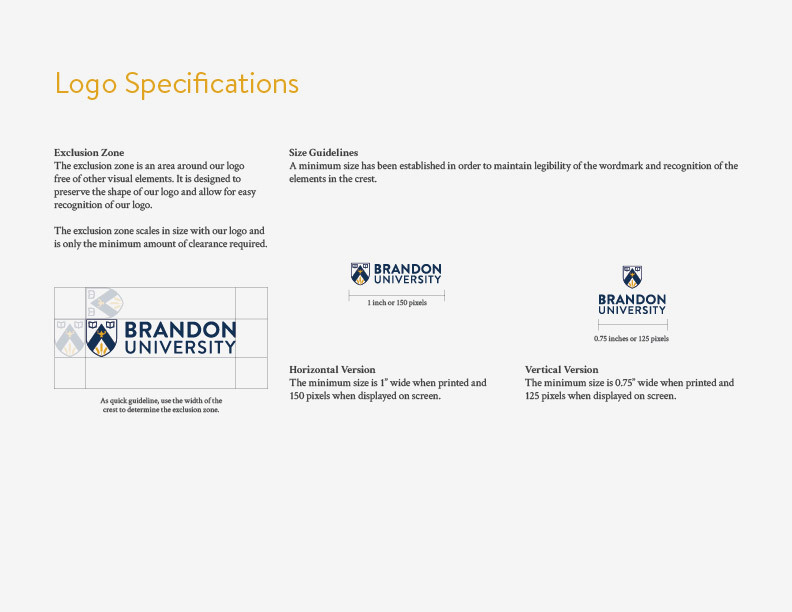 Beyond our visual identity guidelines, we've designed many projects w/ Brandon University. 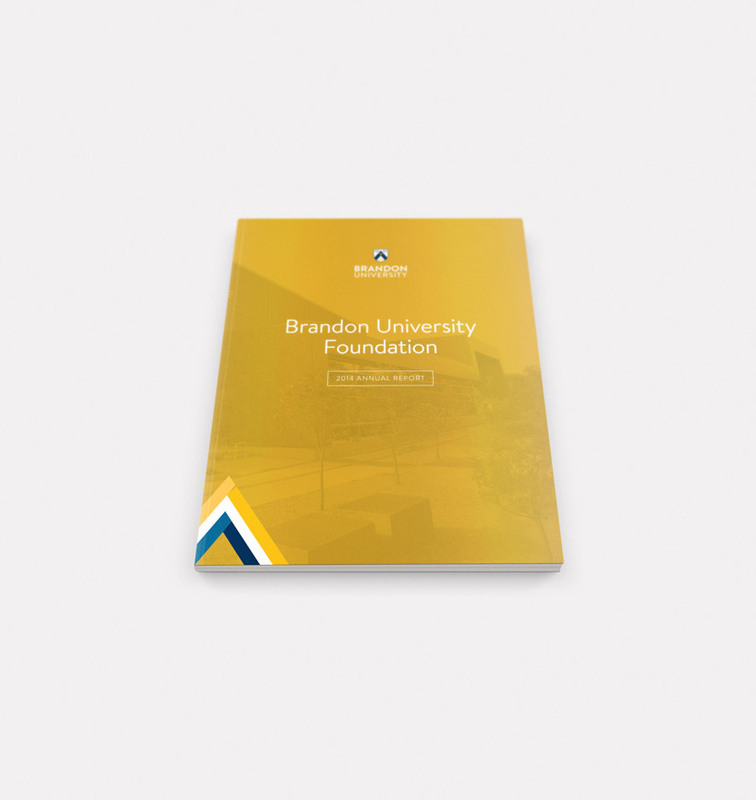 These booklets are Brandon University's primary tool when showcasing the university to prospective students across Canada and abroad. GameChangers is a collection of stories about research, creativity, and innovation at Brandon University. 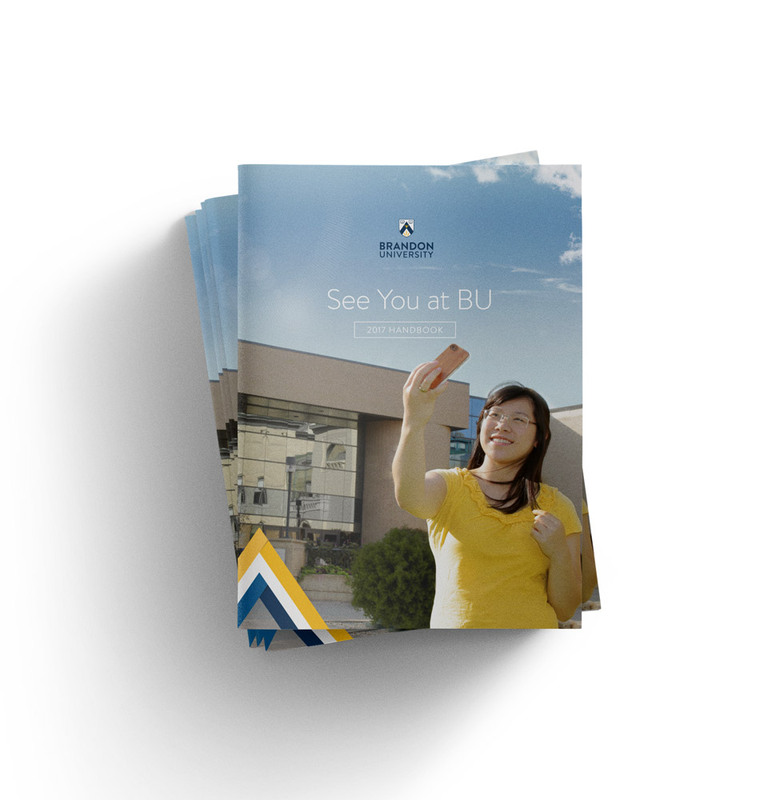 Brandon University produces an annual series of viewbooks for prospective students. They introduce the university, explain its differentiators, and provides high-level information on its programs and pricing. An english, french, spanish, and indigenous version is produced every year. The experience of our collaborators is our first measure of success, valued above all else. Its the 'with' in w/studio. "w/studio's talent and taste are only matched by their level of client service. I look forward to working with them again." "Working together feels very natural. We really value their positive and collaborative attitude." Our project won a Silver Prix D'excellence award in the Best Institutional Branding category in 2015. The Prix D'excellence is the annual awards program of the Canadian Council for Advancement of Education (CCAE) , recognizing outstanding achievements in communications and marketing, alumni relations, fundraising, external relations and student recruitment. The award was in recognition of BU's submission, “Brandon University: A New Visual Identity”, which highlighted its recent rebrand.“To have BU’s rebrand awarded among all the brilliant work across Canadian universities and colleges is extremely gratifying,” said Alex Beshara, BU Communications Officer and project lead. We love understanding and measuring the impact of our projects. These results are our inspiration and validation. BU's new visual identity and standards guide have been of great value to the communications team, new hires, and third-parties creating materials on behalf of BU. Although BU hasn't conducted follow up surveys or interviews, anecdotal interactions with the public have shown exclusively positive feedback. We pride ourselves on respecting both our budget and deadlines. We believe in under-promising and over-delivering. The cost of this project was determined and agreed upon in our initial agreement – we completed the project and the cost remained the same as the agreement. This project had an open deadline which allowed us to order our tasks in an optimal fashion and add tasks as we saw fit. Start to end, this project took 16 months. Does your organization need help w/ a project like this?